Summer is a time for vacation and travel and we know it’s tough to commit to a traditional training program or a rigid training schedule. 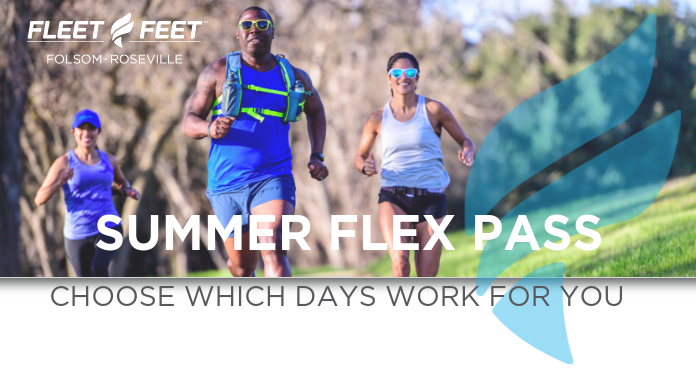 We’d like to provide our Fleet Feet Running Family with flexible training options for the Summer months so that you can join a group workout when it’s convenient for you, and only pay for the workouts you attend. These workouts will be led by a variety of coaches whom you’ve come to know and love, both in the stores and on the road and trail. There will also be a few new faces who come armed with loads of experience and wisdom to share. Weekday runs will be shorter, with speed, hills, and tempo runs sprinkled in. Weekend runs will be longer, conversation-paced efforts. You can view the entire calendar including workout descriptions and locations HERE. Registration is now OPEN! Chose the package that best fits your schedule below. There are no refunds, exchanges or transfers at any time for any reason.